Progression of Animals (or On the Gait of Animals; Greek: Περὶ πορείας ζῴων; Latin: De incessu animalium) is one of Aristotle's major texts on biology. It gives details of gait and movement in various kinds of animals, as well as speculating over the structural homologies among living things. 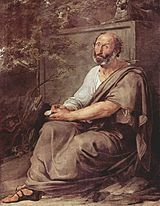 Aristotle's approach to the subject is to ask "why some animals are footless, others bipeds, others quadrupeds, others polypods, and why all have an even number of feet, if they have feet at all; why in fine the points on which progression depends are even in number." It is a good example of the way he brought teleological presumptions to empirical studies. This article about a book on zoology or animals is a stub. You can help Wikipedia by expanding it. This page was last edited on 30 December 2017, at 18:26 (UTC).